The ecology of the upper Rappahannock River is changing. The good news is, fisheries biologists are not alarmed. The bad news is… well, there really isn’t any bad news. 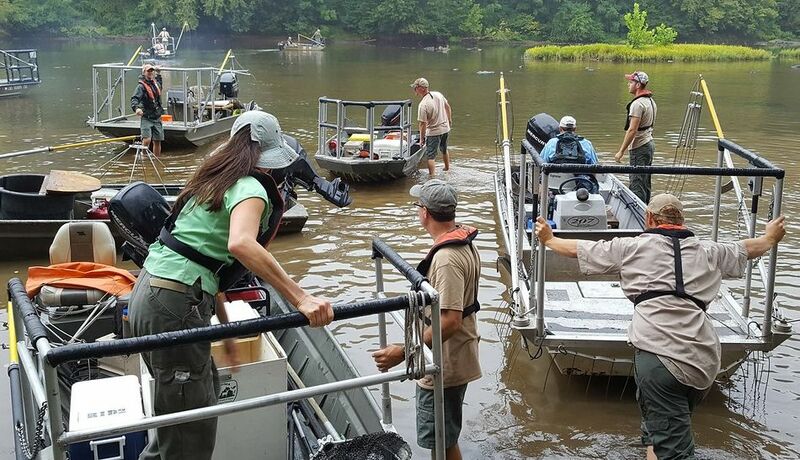 Odenkirk spoke recently about data VDGIF collected in September 2017 by electro-fishing at three sites on the upper Rappahannock River, above the fall line at Fredericksburg. 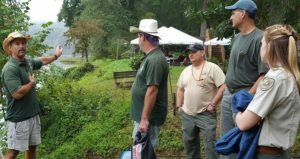 Biologists from across Virginia assisted with depletion studies at Kelly’s Ford, Ely’s Ford, and the Mott’s Run boat launch. A fourth site, in the area of the Friends of the Rappahannock (FOR) office on Fall Hill Avenue, was not sampled due to low water conditions. FOR staff and volunteers helped with the overall effort. Depletions studies were previously done on the upper river in 2010 and 2001. The Embrey Dam was removed in 2004. Based on biomass, or pounds of fish per acre, the most dominant fish in the upper Rappahannock now are channel catfish, replacing white suckers, now the second most-dominant fish in the upper river. The third most-dominant fish are gizzard shad. 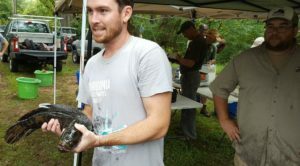 FOR Restoration Coordinator Adam Lynch shows spectators an invasive northern snakehead, captured near the Mott’s Run boat ramp. Depletion data revealed snakeheads are almost non-existent above the fall line. The removal of the Embrey Dam increased geographic access above the fall line, making historical spawning grounds available to desirable fish like American shad, hickory shad, striped bass and eels, for the first time since before the Civil War. At the same time, it increased access to fish like channel cats and gizzard shad. There is also a greater abundance of hydrilla, a type of submerged aquatic vegetation that can be invasive. The presence of hydrilla changes the habitat in ways that are detrimental for some fish, and positive for others. For example, hydrilla may be contributing to increased numbers of largemouth bass and bluegills above the fall line. Abundance of this submersed plant (now nearly ubiquitous across Virginia) has been increasing for years, according to Odenkierk. “The Rappahannock River above the fall line is in transition, but not in a negative way. It’s actually beginning to mirror what we see in the Shenandoah River system,” he said. Channel catfish may be the new top dog in the upper Rappahannock, but they’re not native to the watershed, though they’ve been here for more than 100 years. Channel cats are a naturalized species, meaning that even though they were introduced to the Rappahannock River in the late 1800s by the federal government, they are not considered to be potentially detrimental to the local economy or ecological system. Channel catfish are a naturalized species in the Rappahannock River. Based on biomass, or pounds of fish per acre of water, channel cats have become the most dominant species in the upper river above the fall line. Naturalized species are non-native (sometimes called exotic or non-indigenous), and generally regarded as non-injurious and fully-assimilated, said Odenkirk. It is important to note that the Virginia Department of Health Fish Consumption Advisory for polychlorinated biphenyls (PCBs) in the Rappahannock mainly affects the portion of the river downstream from I-95, so fish from the upper river are generally considered safe to eat. For specific information, click here. VDGIF District Biologist John Odenkirk, left, explains the protocol for the depletion study. 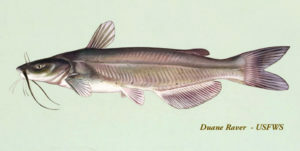 In contrast to channel catfish, blue catfish and northern snakeheads are also non-native, but considered invasive, because they are regarded as having potentially negative effects on the watershed. Odenkirk is Virginia’s leading snakehead biologist, and he’s quick to point out that, so far, snakeheads have not turned out to be the demon-fish they were once considered. “We’re monitoring them closely,” he said, “and in the Rappahannock they seem to be mirroring the population cycle we saw in the Potomac River, but are about a decade behind in the process, due to colonization date. In the Potomac, they arrived, quickly peaked, and after a few years the population seems to have declined and stabilized. Blue catfish did not figure prominently in the most recent depletion study either, coming in at number 14, said Odenkirk. That’s good news for the other fish. Blue cats are very numerous in the tidal section of the Rappahannock below Fredericksburg. They frequently grow to more than 60 pounds, and can prey on Chesapeake Bay blue crabs, white perch and gizzard shad. Odenkirk said blue cats seem to find the watershed above the fall line less habitable. For more information about rules for catching and keeping northern snakeheads, considered by many to be excellent table fare, please click here. Anglers will be pleased to know that smallmouth bass are doing fine above the fall line. Smallmouth bass are naturalized, like channel cats, and among the most prized gamefish in the upper river. “You have to take the smallmouth data with a grain of salt,” said Odenkirk, explaining that smallmouth numbers fluctuate highly based on year-class strength. Year-class refers to the juvenile fish produced during a spring breeding season. FOR Volunteer Art Reynolds, and Fisheries Biologist Mike Isel, bring in another bucket of fish for data collection. Reynolds was among several members of the Falmouth Flats Fly Fishers who helped with the project. That diversity results from factors like the increased dominance of gizzard shad, which produce a lot of juvenile fish that feed hungry bass and catfish. Plus, depletion data suggested smallmouth had excellent reproduction for three consecutive years (2014-16). Odenkirk said largemouth bass and bluegill numbers are increasing above the fall line, but they are not dominant compared to other species. He said another popular species, the redbreast sunfish, is maintaining its biomass. With the increase in dominance of other species, however, it ranked six in 2017, down from three in 2010 and 2001. Redbreast sunfish are the “face” of the river, said Odenkirk, the iconic sunfish of the watershed above the fall line. Less popular, but ranking number four in biomass in 2017, are common carp. Another invasive species, common carp forage for shallow-rooted plants on the river bottom, causing muddy water. The trend is revealing less carp per acre, said Odenkirk. Electro-fishing temporarily stuns fish with low doses of current, so they can be captured, weighed and measured. Nearly all of the fish survive and are released unharmed. Certain invasive species, such as common carp and northern snakeheads, are not released. 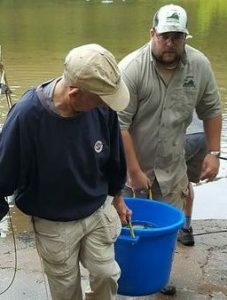 Fisheries biologists from the Virginia Department of Game and Inland Fisheries (VDGIF) use a method called electro-fishing to sample bodies of water for biological data. Specialized boats are equipped with generators, and low doses of electric current temporarily stun fish, which are netted, weighed, measured and released. Each year biologists sample sites in the upper Rappahannock River for qualitative data, said John Odenkirk, VDGIF District Biologist. The resulting data provides a quick snapshot of the river, based on the number of fish captured per hour of electro-fishing. “This gives us information about size structure and relative abundance of fish, compared to previous years,” he said. A depletion study, such as the one done in September 2017, provides a more complete picture of the fish community composition. Depletion studies were done in the upper Rappahannock in 2017, 2010, and 2001. It’s called a depletion study because successive runs of electro-fishing are done until no more fish are captured, said Odenkirk. The fish that are caught are kept in a large holding pen until the study is complete, and then released back into the river. “This gives us data reflecting the total number of individuals, and biomass of those species, in a known amount of water,” he said. 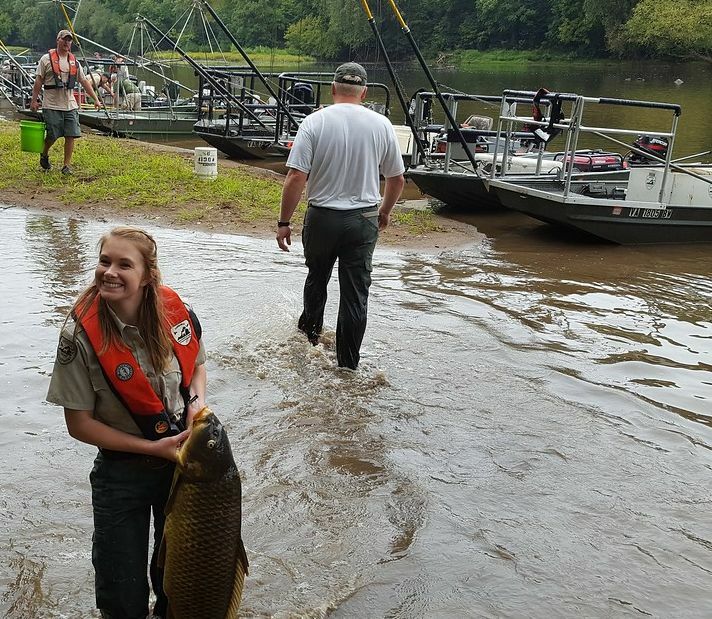 “We then average the data to provide a river-wide basis of comparison.” It’s an all-hands-on-deck project for Virginia’s fisheries biologists. In 2017 as many as 14 boats participated in the count at Mott’s Run. VDGIF will do a depletion study on portions of the James River this coming September.